The WSJ has an interesting article on “reading parties,” (skip the comments). People are getting together to read in silence, which is fine, I guess? The really interesting thing is the list of health benefits to reading, which is included in this handy graphic. 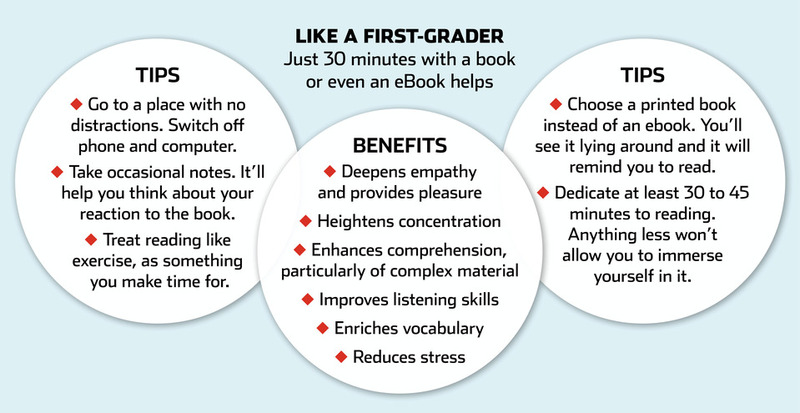 “Reduces stress” is vital, and “Improves listening” makes me think I should have my son read three or four times a day. I’m not saying there’s something wrong with it, but it’s not a choice I would make. If I realize the book I’m reading can’t keep me so absorbed that I stay off Twitter, I put the book away. Then again, I’ve never been the sort who tried to impress people with my reading choices. ADDED LATER: I took the speed reading test. While my comprehension was perfect (partly because I knew I’d be tested) my wpm was 261, slightly above average. That surprises me, because I’ve always believed I was slower than average. I guess I’m just slower than everyone I know.